Well, today marks the day one week ago this "journey" began. The reality of the injury has also set in. This is no quick fix and sometimes coming to terms with the reality of any injury is half the battle. Acceptance is also important since it displaces some of the false hope and doesn't allow the evil post injury depression to get its strong hold. No depression here, reality yes, depression no. I am confident in my choice of action, the team I have selected and the progress i have made so far. The pain and lack of mobility is still there at a pretty high level. I went back to work last week on Wed and Friday. The ankle and foot were very sore but I survived. However, since I made the descision to go back to work early, that meant I had to increase the therapy to combat the extra stress I was causing. That meant an hour of therapy before work, two hours at lunch and an hour after work. If you want the rewards, you must be willing to do the work! Since the swelling still comes and goes and the pain is still at a fairly high level, I am waiting no longer to find out exactly what I have done. I am getting an MRI tomorrow. Most athletes wait 6 weeks because that is what their insurance company states as "their rule". This is not "MY" rule. I want to know now what is up so I can make sure I do everything I can. An MRI will show what Ligaments are torn, the severity of the fractures and how the healing is doing at this early point. The first two weeks are Crucial, according to the research studies I have read, in setting up the overall outcome of any injury rehabilitation. How you handle the first 2 weeks can be the difference between a successful outcome or long term complications such as Chronic Joint instability, Severe bone stress, RSDS (Reflex Sympathetic Dystrophy) or Chronic impingement. Surgery still is not out of the question for me since I have disrupted the entire lateral ligament complex. An MRI will show any positive signs or negative signs which will also enable me to make the proper decisions. Again, I don't want to wait weeks before I make these critical decisions. The good news is, the therapy so far is working. The combination of the laser and Hyperbaric Chamber have been key. 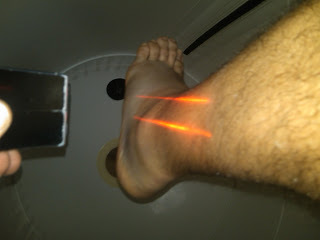 I am able to get 30-45 degrees of pain free ROM in the chamber when used with the cold laser. When I am doing this after Acupuncture the results are even better. I can tell the difference on the days I use Acupuncture and Hyperbaric/Laser when compared to the days I just use stim, ice and massage. I am using a Percussor (strong vibration therapy) at the base of my foot to again stimulate circulation along with the laser set for healing, tissue recovery and neurological support. I also use the percusser to losen my calf and relax protective guarding to allow increased circulation to the injury. I continue to do my push ups and situps daily to maintain the core strength necessary to maintain spinal health since I am using crutches. Also, when I am not doing the above therapy I am on the couch with ice, my leg elevated and in my boot to keep my foot at 90 degrees to maintain neutrality on the injured ligaments. When ever I am up, I have the compression socks and boot on. Again, resting the ligaments these first two weeks is so important. Take a small passive step so I can take aggressive steps in the future. I know not to move to the next step until the current step is completed. How long it takes you to finish each step is up to each individual and each injury must be given individual attention. For me, I am still stuck at the first level. That is ok, some levels take longer than others, Patience and persistance is important. Have you even noticed that people will spend more time, money and give more care to their "prized automobiles" or to their "priceless airlooms" then the do to their bodies? You only get ONE body, how priceless can you get? Treat your health and your body as if its the ONLY ONE LIKE IT ON EARTH, because it is! Tomorrow is MRI day, I am looking forward to this as it will give me more direction and a better time frame. Well, enough typing, my timer just went off, time for more work:-). Keep smiling, keep moving forward and loving life!